Hello everyone, Welcome to my Book collecting page where you will find information on many of the different books published in the Harry Potter Series. First we will look at the number line on each book in the Scholastic's series and explain what all those numbers mean so you can be able to know what you have or what you are getting. Next we will discuss book club books in the series and compare them to the retail version. Lastly for now we will show the oddities, books with errors or rare. Remember I cant go over every book with pictures as I am doing my collection on here, I will try to talk about all the stuff but I want to stay away from using others book pictures so if I dont have it then it wont be pictured here but you are very welcome to email me pictures to add with your permission ofcourse. 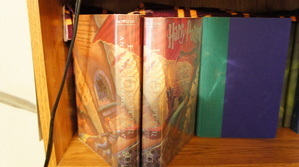 With that lets start with the first edition Chamber of Secrets US Scholastic print and its book club editions. Here is the Hand of Glory on a stripped base, the time turner is from the sticker box sold near the counters at barnes and noble book store and many other places. The time turner is made of plastic and a bit bigger that the original. Of course the time turner was seen in the Prisoner of Azkaban and the hand was seen in the Chamber of Secrets in the deleted scenes. and the book club the words are flat printed on so you could not feel the letters to the touch, this is true for the spine also. The Spine of the retail differs from the book club in a couple ways as the retail has no number 2 on the spine in the earlier printings of the first run the book club edition has the number two of the jacket but not the spine of the book. If you look at the spacing of the title on the book club edition the Words Harry Potter are the same width as the words Chamber of Secrets where the retail version "and the Chamber of Secrets" is longer. The spacing on the spine of the book however match each other in spacing. Its also worth mentioning that there are first edition first printings of the chamber of secrets retail version with the number 2 on the spine but the more sought after collectable version is missing the number as pictured. Pictured is the jackets and the book spines, you also can tell in the picture the book club edition is approx a 16th of an inch shorter than the retail version, and the spine on the the retail version is a green cloth and the book club is a navy blue paper. The covers of the boards differ also, the retail version has a purple section with a diamond patternimpression and the book club edition has a baby blue board plain with no pattern and a navy blue spine. If you turn three pages in (counting the red page) you will see the information page with allot of information including the edition at the bottom. The last three lines on this book tell you the edition, print run, print date and the factory that printed it. The 0/0 stand for 2000 so on and so on. Much later edition still say "First American edition, June 1999" but there not first edition or first prints, that line sorta stays there to let you know when the first edition was printed is my guess as down further you can see a picture of a 35th printing printed in mexico and even after 34 printings it still says "first American edition, June 1999" and allot of sellers read that line and figure they have a first edition and sell it as such but they are mistaken. And in this picture is the Book Club edition, not much to speak on as they are identical. Both the retail and Book Club editions have 341 pages. The book club edition was printed with the same plates as the original so you end up with the same number line and so on but to my knowledge the book club edition was not printed in 1999, I do not have any information on when it was published but if I do find out I will post it here. Printed in Mexico 59, 59 being the number for the factory in Mexico. And like every other copy I have seen it reads "First American edition, June 1999"
So this is not a first editon but it still states that at the bottom which is why I think that its there stating when the fist edition was printed and really has no bearing on this particular copy. I will try to add something each day or every other day so some stuff may only be halfway done so check back often I have allot more to put up but this is where I will stop for now so check back and the next one will be either Sorcerer's Stone or Prisoner of Azkaban. Below is a youtube video I did on these two book, you can click on it and go to my channel for other books comparisons in the HP series. Pictured below is the retail and book club edition of the Prisoner of Azkaban, as you can tell in the photo the book club edition is much smaller so its easy to spot as a book club edition. The letters on the retail version are embossed and the bce are printed. The spine on the retail version 1st edition 1st printing has the number 3 on the jacket and the book spine itself but the book club edition does not display the number 3. The jacket on the BCE is shiny with no raised letters as for the retail version the letters are raised and the material has a textured matte finish. The spine of the book club edition the cover is black with no impression with a black spine and gold letters, no number present on the bce. When you open the retail version first edition first printing the inside cover and first page is orange. Ok lets go to the info page, first we will look at the first edition first printing as you can see right off the bat there is a full number line "10 9 8 7 6 5 4 3 2 1" indicating a first printing. Next there is to the right of the number line a 9/9 meaning 1999 and at the bottom it tells us the first printing was done in 1999 so this tells us this is a first edition 1st printing. The "Printed in the U.S.A. 37" is telling us it was printed in the USA at printing facility 37, I will add 2 more pictures of later editions to compare from Prisoner of Azkaban. Below it the 27th printing printed in the year 2000 at print facility 32. You can see the 9/9 is gone now and the 0/0 is still there. 0/0 stands for 2000 and the number line is now 38 through 27 and 27 being the lowest number is the print number for this copy. Below is another example of print number. This one is a 17th printing printed in 1999 at print facility 12. As you can see the 9/9 is present indicating 1999 print date and the lowest number in the line is 17, you will also notice the line is shorter for the 1st run its 1 though 10 the 11 through 20 and so on and as they finish a print they remove the number for the next run. In much later prints there are more than 10 numbers in the line for higher runs. So we know what print facility it was printed in and in the USA but thats about it, and most book club edition dont have a number line for print run tracking ect. The book club edition that do have the number lin eusually are the larger size books nearly the same size as the original and printed with the original plates. The smaller book club editions usually do not have a number line as they took it out when the new plates were made. I get allot of questions asking how many books I have and well lets just say allot. Page one is getting pretty long so Im creating page 2 for years 4 and 5. you can find the link to page two at the top of the page or.